BIRD FREE ENVIRONMENT. Buy without worry. Paradise Toys, etc. has taken a fresh approach to enriching the lives of pets and their human companions, implementing innovative ideas and technology to solve age old problems. Our goal is to provide pet owners with a range of high quality pet safe products.The company puts forth its best effort to insure that every product we design and manufacture will meet the expectations our customers in terms of performance, price point and availability. Paradise, etc. is committed to its ongoing research projects, listening carefully to customers and providing uncompromising customer service. Recommended for Small birds, such as cockatiels, lovebirds, parrotlets and similarly sized birds. Measures 1 1/2" X 4 1/2"
Awesome cage accessory. Stainless Steel sprial holder effortlessly securely holds 2 generously sized millet sprigs, veggies or treats. NEW Safe, stainless steel bell with recessed clapper - virtually impossible to remove. Fabulous new toy! Also great for toy making. Coiled and braided corn husks. Stuff with treats for foraging. Recommended for all sizes of birds. Coil is 8". Braided husks are 2" wide. Cool new foot toy! Loofa sandwiched between wood discs and wood balls and tied with sisal. Recommended for small birds to medium birds. Use it as a toy! A carnival of delight in three sizes to charm any sized bird. Wooden beads and chewable blocks are strung on a chain. In the middle is a wooden perch with a wooden wheel that spins around as your bird plays. Beads inside wheel clack to inspire your bird to see what's inside. It's ideal for stashing foraging treats. Two quick-link attachments are included so you can use it as a hanging toy or as a swing. Assorted colors. Recommended for small birds, such as caiques, ringnecks, quakers, conures and similarly sized birds. Recommended for medium birds, such as african greys, timneh greys, red lored amazons, blue front amazons, goffin cockatoos, rosebreasted cockatoos and similarly sized birds. NEW Safe, stainless steel foraging cage. Can be filled daily with fresh vegetables or let your imagination run wild! Stuff with paper or wood blocks. Bamboo, wood, chain and sisal 8 x 18 inches! Please note: Wood shapes, colors and sizes may vary from the pictured toy. Great for Medium to Large birds. Strung from a large rawhide lot are chains chock full of fun wood to destroy. Finished off with a bell. Great for Large birds. Strung from a large rawhide lot are chains chock full of fun wood to destroy. Texture galore! Safe sisal rope, plastic chain, wood beads and mini blocks of wood. 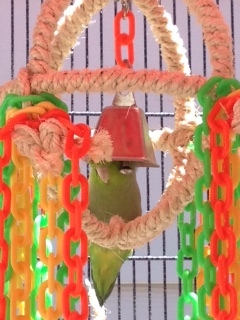 Sisal and plastic chain make this an awesome "swing" for parrotlets to caiques. NEW! Great for shreadding. 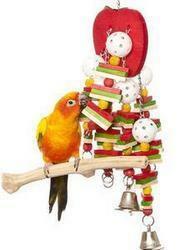 Natural paper stars and wood make this a great tear-up toy for smaller to medium birds.